Touring 42 states, 50 weeks per year, HELLS/BELLS salutes the driving force of AC/DC in a manner surpassed only by the real AC/DC. With authentic costuming, the look, the sound, and all of the crazy antics of Angus Young, HELLS/BELLS is total energy, absolute adrenaline– the most complete party experience acclaimed across the United States, Honduras, Mexico, Trinidad and Europe by many die-hard fans. Hear all the hits of both singers, Bon Scott & Brian Johnson. 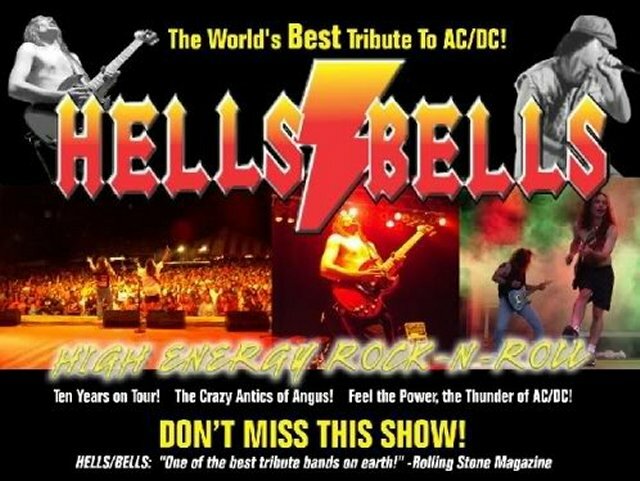 If you can’t have AC/DC, get the next best thing… feel the thunder… The power of AC/DC… HELLS/BELLS! for those about to rock HELLS/BELLS salutes you!